In sanctioning Venezuelan officials and hurling allegations of human rights abuses, perhaps the U.S. is forgetting its own history of instigating violence and fomenting unrest in the South American country and throughout Latin America. 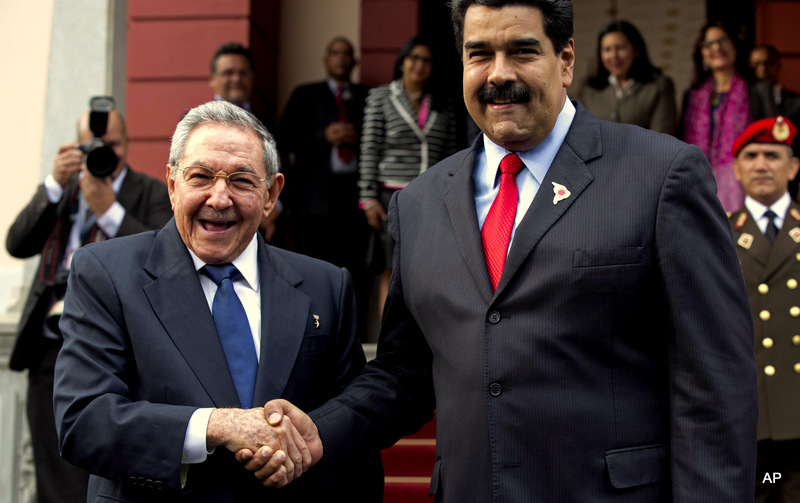 Cuba’s President Raul Castro, left, shakes hands with Venezuela’s President Nicolas Maduro in front of the press after arriving to Miraflores presidential palace for an emergency ALBA meeting in Caracas, Venezuela, Tuesday, March 17, 2015. The Venezuelan-led ALBA bloc of leftist regional governments is expected to express support for Venezuela’s position that its sovereignty is being violated by U.S. attempts to destabilize the country. Addressing the Venezuelan National Assembly on March 10, President Nicolas Maduro declared that the country’s National Assembly elections would proceed as scheduled, regardless of U.S. intervention or action. On the same day, the National Assembly passed an enabling law to combat an executive order signed by President Barack Obama on March 9 and to allow Maduro to take the necessary steps to prevent U.S. interference in Venezuela. Goldwyn was referring to the effects of falling oil prices on Venezuela’s Petrocaribe, a trade program which enables South American and Caribbean countries to buy Venezuelan oil at subsidized prices. Countries benefiting from Petrocaribe have been encouraged to start seeking alternatives like “private investment” and diversifying their energy sources in order to end their complete dependence on Petrocaribe. While Secretary of State John Kerry noted, “If Petrocaribe were to fall due to events in Venezuela, we could end up with a serious humanitarian crisis in our region,” the U.S. is nevertheless seeking to support forces that would facilitate a potential humanitarian crisis. After thousands of workers stormed the foreign-owned oil fields in support of the nationalization efforts, three U.S. companies — ConocoPhillips, Chevron Corp. and Exxon Mobil Corp. — transferred operational control to the state-owned Petroleos de Venezuela in 2007. Individuals involved, including Carmona, a former oil executive, who was nominated Venezuelan president and recognized by the U.S., and Otto Reich, a Cuban exile, who served as director of USAID’s Latin American section, had been received by former President George W. Bush at the White House, where several meetings were held until a few weeks prior to the short-lived coup. 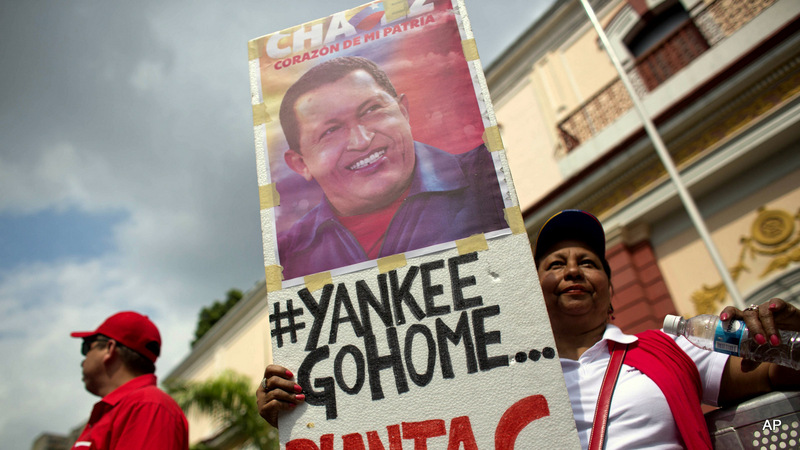 A government supporter holds a sign showing a picture of Venezuela’s late President Hugo Chavez during an anti-imperialist rally at Miraflores presidential palace in Caracas, Venezuela, Wednesday, March 18, 2015. The rally was held amid tensions between Venezuela and the U.S. after President Nicolas Maduro this month said Washington is plotting to oust him and ordered the U.S. Embassy in Caracas to slash staffing levels. The U.S. later levied sanctions against seven Venezuelan officials accused of human rights violations. The Union of South American Nations (UNASUR) held an emergency summit on March 14 to discuss U.S. attempts to instigate additional violence in Venezuela. According to Venezuela’s Foreign Minister Delcy Rodriguez, UNASUR support for Venezuela affirms recognition of imminent threat that could spread beyond the country’s borders to provoke instability in the continent. “If there were to be an intervention on Venezuela, we wouldn’t know when it would move beyond our borders,” Rodriguez said. U.S.-Venezuela relations during Chávez’s era clearly demonstrate the superpower’s ire toward Chávez’s policies, including his alliance with Cuba’s Fidel Castro, the Petrocaribe program, his refusal to cooperate with U.S. intelligence, and the maintenance of relations with countries on the U.S. State Sponsor of Terrorism list. Chávez’s anti-imperialist stance was enough for the U.S. to cite human rights concerns as the reason for fomenting discord and violent opposition — manifested in the 2002 coup and in recent attempts to bring about Maduro’s downfall. 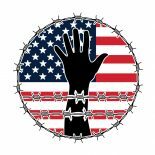 The recent executive order also names seven individuals who have been specifically targeted by U.S. sanctions. The officials are affiliated with Venezuela’s Bolivarian National Armed Forces, the Public Ministry, the Bolivarian National Police and the Bolivarian National Intelligence Service. Venezuela’s process of safeguarding the Bolivarian Revolution is criticized, especially through the document’s description of national level prosecutor Katherine Nayarith Haringhton Padron charging opposition members with conspiracy in relation to coup plots. 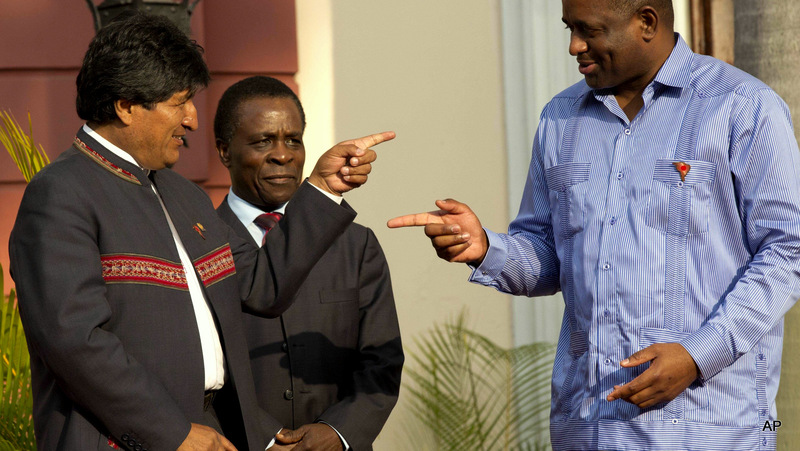 Yet the U.S. government has exhibited no qualms about accusing other officials of human rights violations, despite various reports and photographs depicting the violent chaos orchestrated by the Venezuelan opposition..
Bolivia’s President Evo Morales, left, speaks with Dominica’s Prime Minister Roosevelt Skerrit, right, as Grenada’s Prime Minister Keith Mitchell stands behind as they gather for a group photo at the start of an emergency ALBA meeting at Miraflores presidential palace in Caracas, Venezuela, Tuesday, March 17, 2015. The Venezuelan-led ALBA bloc of leftist regional governments is expected to express support for Venezuela’s position that its sovereignty is being violated by U.S. attempts to destabilize the country. South American governments present during the ALBA summit expressed their opinions about U.S. covert action in Venezuela. Bolivian President Evo Morales insisted that the U.S. is embarking upon divisive tactics after the imperialist power failed to destroy the region politically, economically and through the imposition of military dictatorships. He further criticized the double-standard applied by the U.S. regarding alleged human rights abuses. “In Latin America and the Caribbean we have no death penalty, the worst violation possible of human rights, but it does exist in the U.S.,” Morales said. Indeed, the current scenario involves the U.S. pursuing the same goals, but with a different strategy, as Raúl noted. Venezuela is battling overt and covert actions by the U.S. through its funding of the Venezuelan opposition and its participation in attempted coups. Despite attempts to discredit the Venezuelan government’s claims, opposition leaders Leopoldo López, María Corina Machado and Antonio Ledezma signed a statement the day before the recent failed coup, titled “A Call on Venezuelans for a National Accord for the Transition,” which, above all, sought to apply the allegedly meritocratic policy to oil purchases. 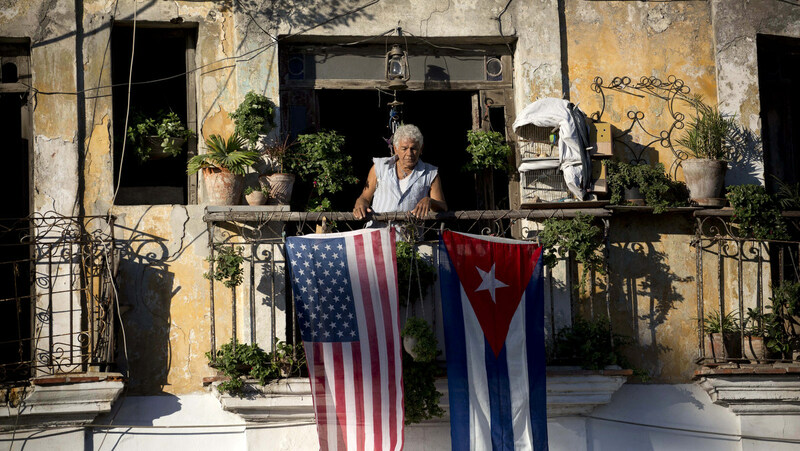 Javier Yanez stands on his balcony where he hung a U.S. and Cuban flag in Old Havana Cuba, Friday, Dec. 19, 2014. Photo credit: AP. Meanwhile, Cuba is in the process of normalizing relations with the U.S. following the December prisoner swap that saw the release of the remaining imprisoned members of the Cuban 5 in exchange for USAID subcontractor Alan Gross and an unidentified U.S. spy. According to AFP, Obama is aiming to re-open embassies in both countries prior to the Summit of the Americas, which is to be held in Panama from April 10-11. This entry was posted on March 25, 2015 by conspiracyanalyst in American Foreign Policy, Communism, International News, Latin America, War & Peace and tagged American Foreign Policy, Cuba, Venezuela.